MGP Caliper Covers at JM Auto Racing. Upgrade the appearance of your calipers, reduce their operating temperature, and reduce the amount of brake dust on your wheels with these caliper covers. 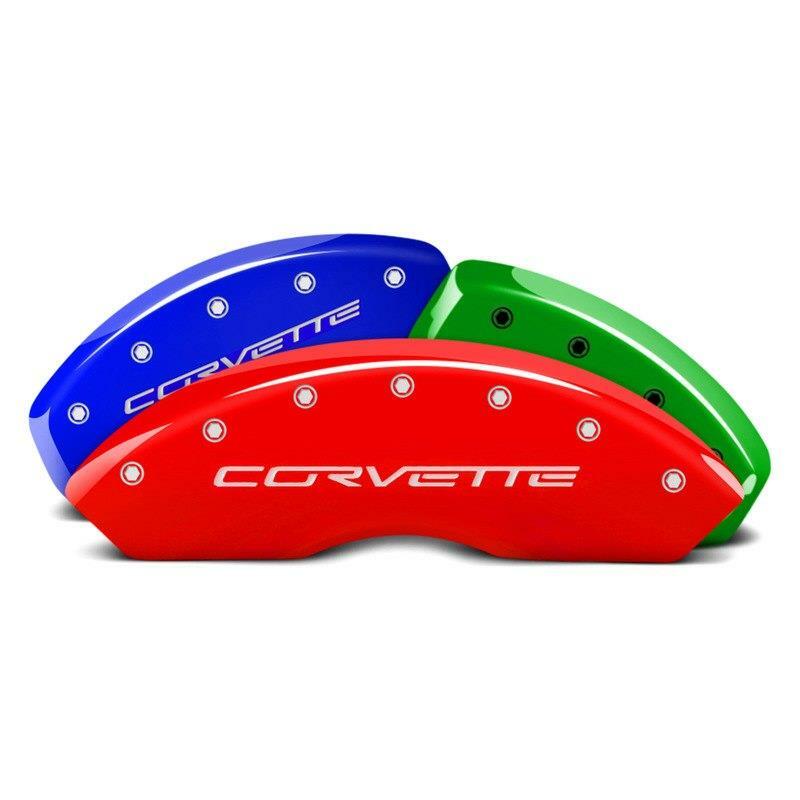 These quality, aerospace aluminum covers are the smart alternative to painting your calipers, and come in your choice of finish and with the logo CNC high speed engraved. Everything is included for an easy installation. Today's original equipment and aftermarket large diameter, thin spoke wheels look great, but they expose a lot of the mechanical parts behind the wheels that often don't look so great, particularly the brake calipers. You can paint your calipers, but it takes a lot of time and effort to do the job yourself, or a lot of money to pay someone to paint them for you. Plus there are considerations with painting beyond the initial paint job. The paint will often peel, even if the surfaces are meticulously cleaned, and even the best paint job probably won't stay looking good for more than a year. And no paint job will be able to do anything about the shape of the calipers, which often isn't that appealing. MGP Caliper Covers are available with your choice of logo applied using proprietary CNC high speed engraving techniques. Your wheels will stay much cleaner, because these caliper covers help reduce brake dust. You'll also get reduced caliper temperatures with MGP Caliper Covers. When checked with an infrared thermometer gun, it was found that caliper cover equipped brake calipers were 30-50 degrees F cooler than brake calipers without caliper covers. MGP Caliper Covers act as a heat sink, drawing heat out of the brake calipers, prolonging the life of brake system components and reducing the potential for brake fade. This OFFICIAL LICENSED FOR FORD and GM VEHICLES product offered by MGP is a unique vehicle customization solution that increases style of car with a big brake look. Everything required for an easy installation is included with your MGP Caliper Covers, including detailed instructions. Clips are used to hold the caliper covers to the calipers, and the bridges that the clips attach to are TIG welded to the covers for strength. MGP Caliper Covers will not interfere at all with brake system operation and they're easy to remove and install when brake service is required. MGP warrants these caliper covers against any manufacturer's defects for a period of 3 years from date of purchase. MGP Caliper Covers are proudly made in the USA. MGP (Marshall Genuine Products) is an American manufacturing company located in San Diego, California that specializes in brake caliper covers. Like many car enthusiasts, MGP President Mike Barland purchased large diameter, custom wheels for his car and subsequently found the exposed brake calipers aesthetically unappealing. He began MGP after finding aftermarket solutions for improving the appearance of his brake calipers unsatisfactory. MGP Caliper Covers are the culmination of 4 years of development, drawing on 26 years of engineering experience and technologies developed for the manufacturing of titanium, stainless steel and aluminum products for the aerospace and recreation industries. They add style and color to your vehicle, but also reduce brake dust and lower the caliper operating temperature.